For anyone unfamiliar with what RGB video is see this Video Primer. SCART pinouts and signal info can be found here. SCART (aka Peritel or Euroconnector) cables for home video game consoles aren't standard, they are different for each console. The manufacturers have taken full advantage of this and, in what I assume is an effort to save a few cents, often place necessary components (esp. coupling capacitors) of the RGB output circuit inside the SCART cable. Since only a small fraction of people who own a console use/require a SCART cable it slightly reduces the overall cost. TVs with SCART inputs are only common in Europe and Australia (mainly because we share a similar TV standard (thus TV designs) with most of Europe and the TV manufactures just leave the connectors in place). If you are from a somewhere where TVs with SCART inputs are rare then don't despair, some of the upper market TVs offer RGB input in the form of 4 phono sockets, one for each colour and one for composite sync. If such a TV can't be found for a reasonable price, then look around for an old RGB computer monitor that is compatible with the TV horizontal scan frequency, such as the commodore 1084 monitor. Alternatively, if a suitable monitor can't be located and you're good with electronics, then consider building a SCART to arcade monitor adapter. The SCART spec states that to switch to RGB mode the CVBS Status pin must be fed 12V and the RGB Status (aka Fast Blanking) pin be fed 1-3V. Some games consoles only output 5V which may or may not be adequate. If the TV doesn't switch and there is no way to manually force a 'video mode' (such as a button on the remote control) then an external 12V supply may be required. In cases where the TV is a widescreen model or has a widescreen mode feature, applying only 5v to the RGB Status pin may force the TV into 16:9 widescreen mode. 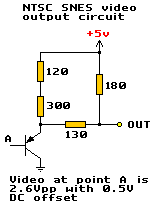 In the diagrams I have drawn all the SCART ground pins connected together. This isn't required but it's a good idea to connect to at least two ground pins (usually 17 and 18). If you're using mini-coax to connect the RGB video (recommended if the cable is going to be long) then ground pins 5, 9 and 13 provide handy places to solder the shield. The reverse applies to the console end of the cable. I've only drawn one ground connection but it may be a good idea make use of other ground connections (if there are any). A/V output comes from an 8 pin female "U" DIN connector. Pinouts are: 1 composite video, 2 ground, 3 audio, 4 green video, 5 +5V DC, 6 composite sync, 7 red video, 8 blue video. RGB output circuit: Sony CXA1145 video encoder IC - outputs come straight from the chip. A/V comes from a female 9 pin mini DIN connector. Signals are the same as the original Megadrive with the addition of stereo audio. Pinouts are: 1 blue video, 2 +5V DC, 3 green video, 4 composite video, 5 composite sync, 6 audio mono, 7 red video, 8 audio left, 9 audio right, and the metal shield is ground. RGB output circuit: CXA1145/CXA1645/KA2195/MB3514 video encoder IC - outputs come straight from the chip. Connector is a 10 pin mini-DIN type. While it's a standard connector, it's extremely rare so don't expect to be able to buy one from the local electronics shop (or anywhere for that matter). The Saturn puts out luma/chroma (s-video) as well as the usual RGB/CVBS. Pinouts: 1 composite sync, 2 audio right, 3 audio left, 4 +5V DC, 5 red video, 6 green video, 7 blue video, 8 composite video, 9 luminance, 10 chrominance. RGB output circuit: signal comes out a CXA1645 through a 75 ohm resistor and a coupling cap. Utilises a proprietary connector for A/V out. Supports CVBS, RGB (TV), RGB (VGA, req. adapter) and luma/chroma. Pin 7 must be connected to ground to enable RGB. Pinouts: 1 ground, 2 audio right, 3 audio left, 4 +12V DC, 5 +5V DC, 6 RGB (VGA) select, 7 RGB (TV) select, 8 vertical sync (for VGA), 9 horizontal sync (for VGA), 10 composite sync, 11 chrominance, 12 luminance, 13 composite video, 14 blue video, 15 green video, 16 red video. RGB output circuit: proprietary DAC. For some unknown reason the RGB output circuits differs between the NTSC and PAL consoles. As a result the cables are different too (though I somehow doubt Nintendo had any intention of releasing a SCART lead for the NTSC SNES). Proprietary A/V connector. Pinouts: 1 red video (PAL only), 2 green video (PAL only), 3 +12V DC, 4 blue video (PAL only), 5 ground, 6 ground, 7 luminance (NTSC only), 8 chrominance (NTSC only), 9 composite video, 10 +5V DC, 11 audio left, 12 audio right. RGB output circuit: proprietary DAC. Like the Gamecube, RGB video is only available from the PAL Wii. Proprietary A/V connector (different to the proprietary A/V socket used on previous nintendos). Pinouts: 1 left audio, 2 right audio, 3 composite video, 4 +5v DC, 5 ground, 6 ground, 7 red video (luminance/NTSC), 8 mode select, 9 green video (chrominance/NTSC), 10 mode select, 11 blue video, 12 ground, 13 +12v DC. Pins 14-16 are for something called a Japanese D-Terminal Cable. Mode select pins are normaly left unconnected. When they are connected together, component video (YUV/YPbPr) will output from pins 7, 9 and 11 in place for RGB/S-video. The DC voltage on pin 13 will drop to 5v for widescreen games (will it?). Sony PlayStation / PlayStation 2. Propriety connector. Pin outputs: 1 ground, 2 audio right, 3 ground, 4 audio left, 5 luminance, 6 composite sync, 7 chrominance, 8 ground, 9 blue video, 10 +5V DC, 11 red video, 12 green video. RGB output circuit: signal comes from a CXA1645 and a through a 75 ohm resistor. Female 8 pin "C" DIN connector. Pinouts: 1 audio mono, 2 ground, 3 composite video, 4 +5V DC, 5 green video, 6 red video, 7 composite sync, 8 blue video. RGB output circuit: signal comes out a CXA1145/MB3514, through a 75 ohm resistor and a coupling cap. Propriety connector. Pinouts: 1A audio left, 2A audio ground, 3A n/c, 4A video ground, 5A blue video, 6A horizontal sync, 7A green video, 8A chrominance, 9A n/c, 10A INC (??? ), 11A unregulated DC voltage from power input, 12A n/c, 1B audio right, 2B audio ground, 3B video ground, 4B red video, 5B vertical sync, 6B n/c, 7B video ground, 8B luminance, 9B ground, 10B video ground, 11B composite video, 12B n/c. Krapoutchik a écrit : Schéma du câble vidéo ATARI 1040 vers PERITEL. Propriety connector. Pinouts: 1 audio right, 2 audio ground, 3 SP-DIF digital audio, 4 vertical sync?, 5/6/7/8 ground, 9 video output A (blue), 10 video ground, 11 video output B (green), 12 video ground, 13 +5v, 14 audio left, 15 audio ground, 16 horizontal sync?, 17/18/19 video mode select (ground all three for RGB), 20 +12v (RGB Status), 21 video ground, 22 video output C (red), 23 video ground, 24 video output D (composite video). Different audio/video configurations are selectable by maniplating the three video mode select pins (17, 18 and 19). See the Gamesx Xbox pinouts page for more info on this. The DC voltage on pin 20 will drop to +5v for widescreen mode. Diagrammes d'ALICE et ALICE 32. Matra & Hachette ALICE 90. La réalisation du câble péritel de l'Alice 90 exige d'acquérir un câble du commerce de bonne qualité et respectant les normes de fabrication attendues, à savoir que les liaisons des broches 7, 11, 15, 19 & 20 doivent être réalisées avec du câble coaxial de faible diamètre (~3mm maxi) et d'impédance égale à 75 ohms. Pour la broche 6, normalement il faut un câble blindé basse fréquence. Les prises SCART utilisées doivent, évidement, être démontables. Attention: Les câbles à bas prix ne sont pas adaptés car en général des économies sont faites pour les liaisons qui deviennent des liaisons simple fil ou dont le câble coaxial utilisé est de mauvaise qualité et présente des caractéristiques techniques (impédance et atténuation) en dehors des normes. Merci à Guillaume VERHOOSTE pour le lien. Modifié en dernier par Casio le 10 déc. 2013, 21:28, modifié 6 fois. Waw diagramme qui pourrait bien être utile . Rajout ce jour de 2 diagrammes et mises à jour de l'ensemble. Rajout ce jour d'un schéma made-by-Krapoutchik pour les ATARI ST.
J’espère que ça pourras aider, je l'ai réalisé au megomètre sur mon propre câble.